I was glad to hear that Richard Powers won the National Book Award for "Echo Maker," not because I had read the book but because Powers' name was the only one of the nominees whom I recognized. After reading Colson Whitehead's New York Times review, which was published before the nominations were announced, I had planned to buy the book. 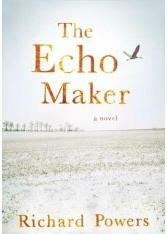 Whitehead contends that "Echo Maker" is one of the best post-9/11 novels. He writes, "Powers accomplishes something magnificent, no facile conflation of personal catastrophe with national calamity, but a lovely essay on perseverance in all its forms."